Ever since seals were incorporated in bearings, their reliability has transformed, particularly in contaminated environments. 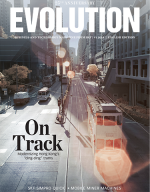 Now, developments in seal design for small sealed SKF Explorer spherical roller bearings are set to offer even greater benefits in terms of improved performance across a broad range of applications. 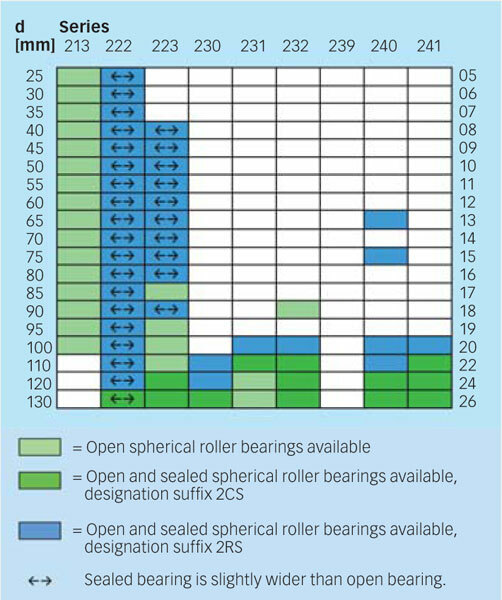 Taking a look at how to make bearing seals in a better way has resulted in a better seal for small spherical roller bearings. The new seal replaces three different sealing solutions with a single all-embracing design. For SKF’s range of small spherical roller bearings of up to around 180 mm in outside diameter, the future is a new economical seal design that offers lower need for maintenance, extended service intervals and overall improved performance across a range of applications. 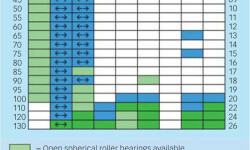 SKF engineers decided to take a fresh look at SKF’s seal designs for spherical roller bearings with two principal aims – to further improve seal performance and to improve manufacturing processes within the company (fig. 1). Prior to undertaking the development phase of the project, SKF engineers set out the functional requirements for the new sealed bearing, in particular the bearing function and its interaction with the seal. Specialists in spherical roller bearing design and function, worked with experts in seal design and function. They upgraded the seal, using design and development tools, including computer simulation, backed by prototype building and verification testing. 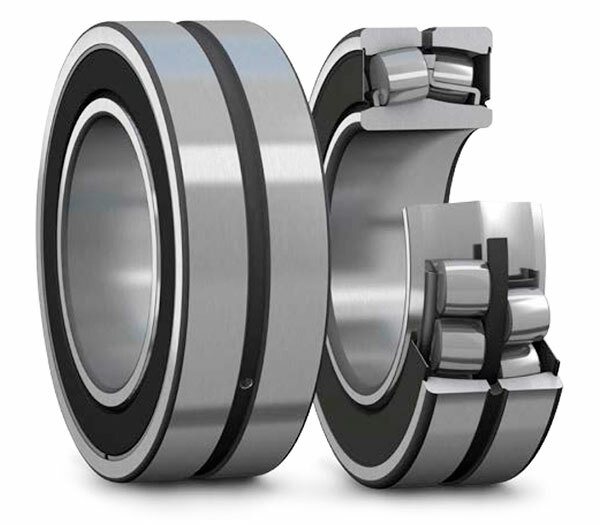 SKF first introduced sealed spherical roller bearings in the early 1990s. Such has been the success of these bearings that there are more than 100 standard products in its assortment. Following positive results for its improvement programme, SKF is rolling out the new seal design as a single standard through most of its small spherical roller bearing size range. 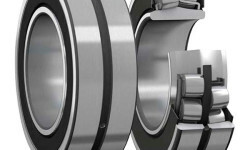 The sealed bearings can be used for a wide range of applications – from elevators and cranes to fans and food and beverage processing equipment. 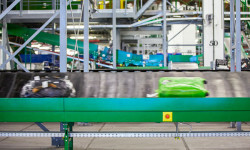 Baggage handling systems at airports are a very typical application. In terms of performance, the new seal can result in up to 50 % lower seal friction and as much as 20 % lower total bearing friction. 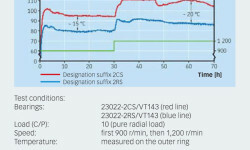 Operating temperatures can be reduced by as much as 20 °C. 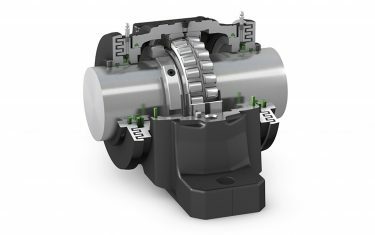 Bearings incorporating seals to the new design can operate at approximately twice the limiting speed rating of previous SKF sealed bearings of the equivalent size. Coupled with this, the new seals contribute to reduced maintenance requirements, thanks to longer lubricant life. In many applications the bearing can be considered relubrication-free. Until recently, SKF had three main types of seals used within the small spherical roller bearing range. 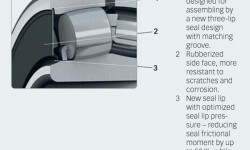 They are now replaced by seals to the new design that will carry the designation suffix RS, and 37 bearing sizes up to and around 180 mm in outside diameter (fig. 2) will benefit from the new sealing solution. There is a choice of two seal materials made from two different rubber compounds, acrylonitrile-butadiene rubber (NBR) or hydrogenated nitrile butadiene rubber (HNBR). NBR has very good engineering properties and is a general-purpose sealing lip material. It is a copolymer manufactured from acrylonitrile and butadiene, which provides good resistance to most mineral oils and greases with a mineral oil base, fuels such as petrol, diesel and light heating oils, animal and vegetable oils and fats, and hot water. HNBR is a saturated copolymer of acrylonitrile and butadiene, suitable for applications with aliphatic hydrocarbons and mineral oils with physical and chemical properties that vary depending on the polymer’s composition. 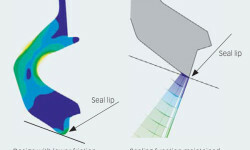 In essence, three design elements contribute to the improved seal performance (fig. 3). A new seal groove design in the outer ring improves seal anchorage for a better fit and for facilitated mounting. Firstly, it enables a high retention torque to reduce the risk that the seal rotates in the retention groove. Secondly, the design has a new rubberized seal face that is more resistant to corrosion and scratches. 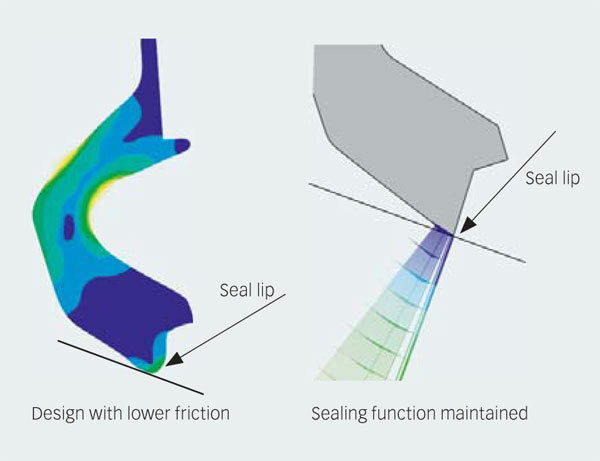 Finally, a new seal lip with an optimized contact pressure has been created that helps reduce the seal frictional moment. 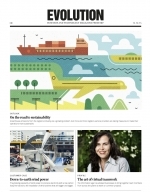 SKF Seal Designer was used to standardize the solution. 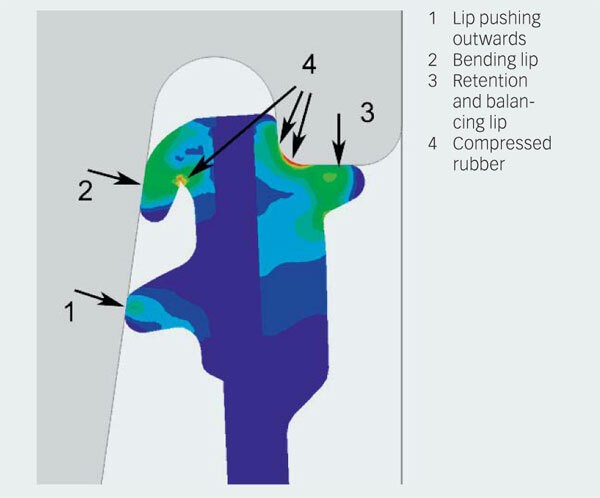 The reduction in frictional moment enables higher speeds without damaging the seal lip. The new limit is set to a maximum seal lip speed of 10 m/s, compared with a previous limiting speed set to approximately 20 % of the limiting speed for the open bearing. For most of the bearings, this means approximately twice the previous speed limit. When selecting sealed spherical roller bearings operating at high speeds, it is important that the operating temperature does not exceed the maximum recommended temperature for the seal material. The limits are 90 °C for the standard NBR material (suffix RS) and 150 °C for HNBR material (suffix RS5). The reduced frictional moment from the bearing seal results in less heat generation, leading to a lower operating temperature. In tests with typical operating conditions, the bearing temperature reduction is approximately 15 to 20 °C (fig. 4). In practice, this lower operating temperature can be translated into slower ageing of the grease, and thus can support longer relubrication intervals. 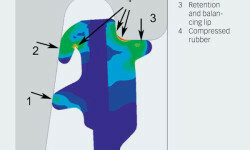 A reduction of the operating temperature by 15 °C doubles the relubrication interval. 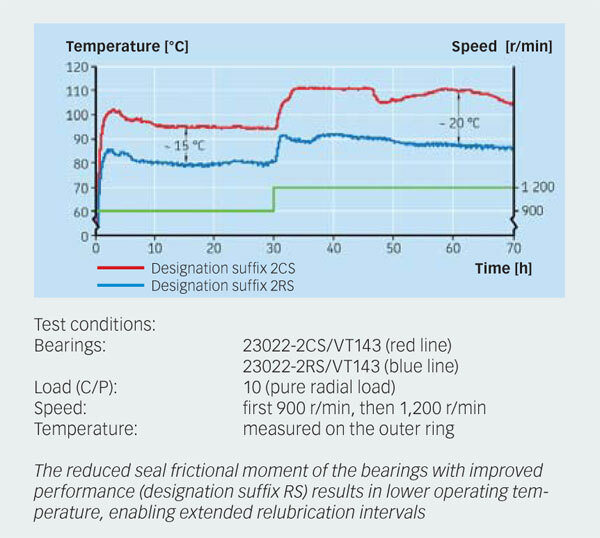 A longer relubrication interval enables more bearings to be operated without a need for relubrication at all. 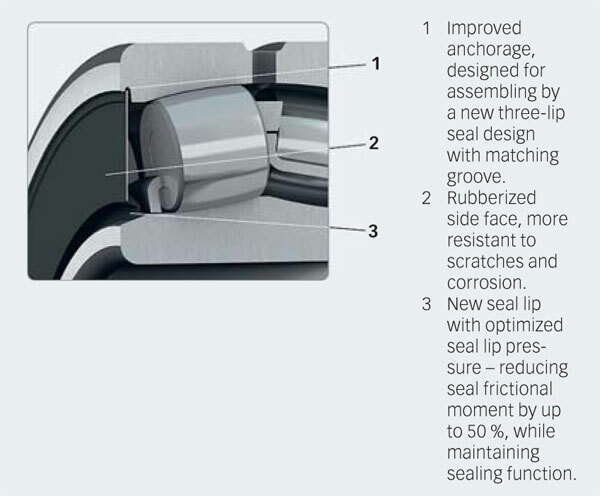 SKF has carried out a stringent testing regimen to confirm the perform-ance of the new seal design. This included measuring the seal frictional moment at different speeds for bearings of three different sizes (fig. 5). The average seal friction reduction is approximately 50 %. The Arizona dust test is a well-established regimen for gauging how well a seal performs in excluding contamination. Performed in a dust chamber, the test measures the amount of contaminants inside the bearing, and it shows that the new seal lip is as efficient as the current design or even better at sealing off dry contaminants. To make sure that the seal is securely fastened in the outer ring, three tests are conducted to verify correct anchorage. The tests show that the seal anchorage is improved (fig. 6). 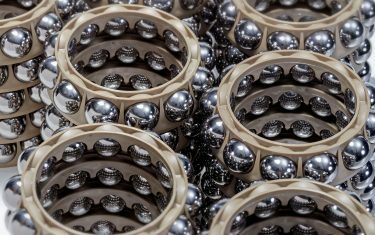 Sealed spherical roller bearings are supplied lubricated and ready to mount. Rubber seals require lubricant, and in a sealed spherical roller bearing the seal is lubricated with the grease from the bearing. A small leakage of lubricant is therefore to be expected. Factors that influence the grease leakage are speed, temperature, misalignment and mounting direction, and the amount of leakage is thus difficult to estimate in advance. 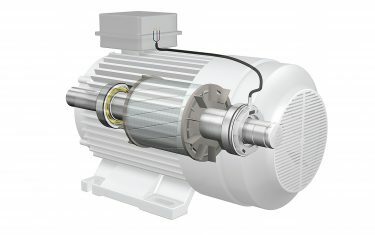 The new seal has been tested with typical application conditions for elevators, and the grease retention capability is the same as for the current design. In conclusion, the new seal design opens up the possibility for more applications to be considered as relubrication-free, thanks to the improved sealing performance. In addition to living up to SKF’s intention of streamlining its own manufacturing efficiencies, the seal can deliver significant end-user benefits in terms of performance and extended service life.